It was a very quiet week on the athletics scene and only a few races and Wesham members out competing. Alan Taylor takes off on his Three Peaks +Cycle Challenge this week spread over 10- days with 14,000ft of climbing on the three mountains and a further 11,200ft of hills over the 470-mile bike ride from Fort William in Scotland to Llanberis in North Wales, raising money for Rosemere Cancer, Mummy’s Star and Bowel Cancer in memory of Ben Ashworth and Graham Vickers. David Taylor ran the latest Sale Sizzler on Thursday evening, completing the 5km course in Wythenshawe Park in a swift 17:17 for 47th place in a quality race, won in 14:25 by Mohammed Aburezeq. There were 496 runners in this popular mid-week series. Kath Hoyer finished 3rd woman and 1st W55 in the Darwen Gala Memorial Fell Race on Saturday clocking a time of 49:12 for the 4.7 miles and 928ft climb. In Andy O’Sullivan’s 30 Years of Races Cowm Reservoir 5km on the Sunday from Whitworth Kath Hoyer finished 4th woman and 2nd W55 in 24:26, 53rd overall. Dave Waywell was 5th M70 in a very competitive field placing 91st overall in 27:55. Helen Lawrenson finished 5th in the Fleetwood Half Marathon on Sunday in a time of 1:21:40 to place 1st woman in a race which apparently went a short course due to a marshalling error. Lee Nixon finished 9th in 1:23:39 coming in 3rd M35. The first two finishers were disqualified for reason yet unknown. David Taylor lead the way for Wesham and recoded the third fastest time of the day at the Lytham Hall parkrun, completing the two-lap 5km course in 18:05 for an age graded performance of 71.71% with the fastest time of the day set at 17:22. Carl Groome ran 19:06 for M45 76.61%. Jason Blagden clocked 21:22 for M45 66.85 with Jonathan Lawson running 21;48 for M50 67.66%. Sharon Cooper was next having also organised the volunteer roster for the morning and she ran 23:27 for W45 67.73%. Phil Leaver set an M65 performance grade of 71.05% with a time of 23:36 and Graham Cunliffe ran 25:36 for M60 63.74%. Diane Bladgen ran 26:50 and scored a W50 rank of 64.04% while Peter Rooney had 26:52 with an M55 grade of 59.18%. Antionette Holton ran 27:39 for 53.77% and Kerry Eccles W55 65.38% with a time of 27:41. Elizabeth Johnson ran 28:00 for W35 54.29%. In the Preston parkrun Nigel Shepherd ran 20:56 for M60 76.59%; Robert Brown returned 25:02 for M60 64.65% and Gemma Owen 27:13 for W35 55.60%. Chris Pike was out at St Helens for 25:27 for M40 54.88% with a consistent run against last week. In the Blackpool run George Kennedy ran 22:21 for M60 71.74%; Stephen Browne 22:53 with an M50 grade of 65.48%; Andrew Moore 27:06 for M55 57.20%; Michael Hall 28:26 and M40 49.47%, with Dave Marsland taking a pacesetting role to run 59:02 for tail sweeper. 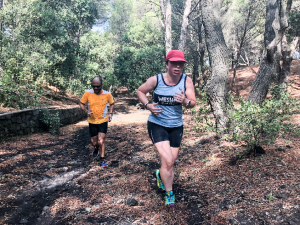 The travelling Gores were in Sicily and took in the Etna parkrun of the slopes of the famous dormant volcano, with Steven running the fastest time of the day with 21:43 on the inclines and extreme heat for M35 61.47%, with Vicky a more modest 32:03 for W40 48:36. There were only 13 finishers in this week’s event. At the Fleetwood Promenade event John Burns ran 22:54 for M60 grade 71.91% with Nicola Carter taking 31:09 for a W35 48.15%.